I know, a clickbait headline. I must be exaggerating, right? Unfortunately, I’m not. If you work for yourself for two or three decades and don’t follow this advice, you could be leaving $100,000 or more per year on the table. That’s already millions of dollars lost, ignoring the effects of cumulative growth in your income, investment returns, better quality of life, and not having to give up freelance and get a job because you can’t make ends meet. Making this mistake can absolutely be the difference between barely surviving as a freelancer (or not), and thriving as a successful solo consultant. Learning this lesson changed me overnight from a freelancer to a consultant, and from this being a temporary stepping stone in my mind to something that I could envision myself doing for the rest of my life. So what’s this big mistake? I’m a big fan of simplicity and trying to distill complicated concepts down to their essence. And when you’re trying to run your own solo consulting practice, there are a LOT of complicated concepts. It can be overwhelming to even know where to start, what applies to you, and what will make the biggest difference. In this article, I’m going to lay out a list of reasons why charging hourly is terrible for you and your clients, provide a path forward from hourly billing, and answer some common objections I hear to this freelance rate advice. I’ll cover why hourly billing is unfair to you in just a minute, but first I want to tell you why it’s not fair to your clients. And I’m sure that’s true. But when you’re incentivized to take as long as possible, you also probably won’t be searching diligently for ways to deliver those results in a fraction of the time either. In practice, this means things like optimizing your processes, subcontracting, automation, and just working faster and more productively because you will be capturing the fruit of those gains. Wouldn’t it be better for your clients if you were incentivized to constantly be looking to deliver the results they’re trying to buy even faster and more efficiently? Hourly billing focuses you and your client on the inputs of the work you’re doing for them, not the outputs. The best thing you can do for your clients is become fully focused on the results you deliver for them, not how many hours you’ve worked. Billing hourly is literally you selling an hour of your life to a client. But no client in the world wants an hour of your life. They want to buy the output that they hope you’re going to produce with that hour. They don’t really care how long it takes, because the result is what they’re after. So why not just sell them that result? Your clients want to buy results. So sell them results! They like to know what they’re paying. As a result, clients aren’t satisfied with an hourly freelance rate alone. They also want an upfront estimate on the number of hours. So now there’s a ceiling. And you’re not going to be able to go way over those hours without some kind of fallout. You now have the worst of both worlds, because you’re taking the risks for both sides of this transaction. 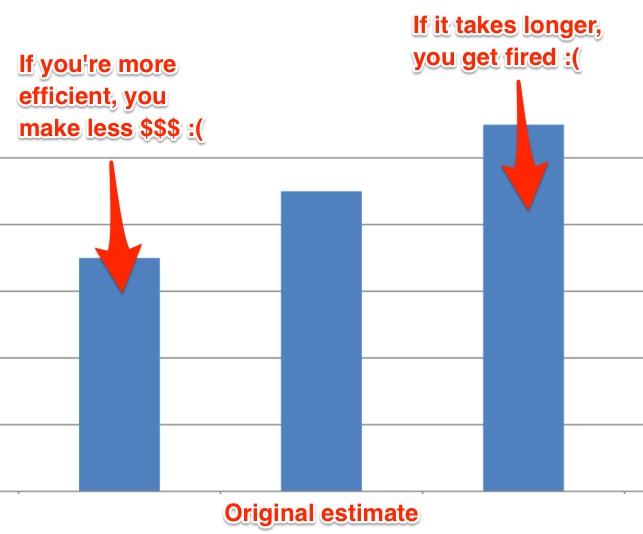 If it takes you twice as long as your estimate, the client will push back, perhaps demand a refund, fire you, etc. But if it takes you half the time that you estimated, the client will expect to only pay half. That’s a lose-lose proposition for you. If you do it right, you can definitely make more money by not billing hourly, so that’s obviously better for you. It’s often better for your clients if you don’t charge an hourly freelance rate. Talk to anyone who hires freelancers regularly and they’ll tell you how unreliable freelancers can be, and how frustrating it is working with them, trying to get things done on time, etc. Now, are all those flaky freelancers just bad people? No! Mostly they’re just doing the best they can, scraping by, working way too much, making way too little, and hoping things get better. And sometimes they reach the breaking point and disappear. Not the right way to go about it, of course, but if they were making more money, their situation would be lower stress and more sustainable. You don’t want to be a commodity, easily compared and weighed against the other alternatives (also charging “market hourly rates”). You want to be a monopoly. You ideally want clients to see you as the only possible solver of their problem. Hourly billing works against that, because it distills your entire package of expertise, value, and approach down to a single number to be compared with other freelancers. Ok, so if you’re not going to charge hourly, how should you bill? That depends on the type of work you’re doing. If you’re working on a specific project that has a scope attached, like building a website, designing a logo, or writing a marketing report, you should charge a flat price for the project (using value pricing). This should probably be the bulk of your billings, especially at first. If you’re working on a substantial task that is necessarily of indeterminate scope, like doing R & D, prototyping where it’s unclear how long what you’re building or designing will take, doing open-ended research, etc, you should charge a weekly rate. Depending on your circumstances, you could also charge a monthly rate, or in the worst case scenario, a day rate, but that’s the absolute smallest unit of time I’d consider. This should not be the primary way that you bill (more on why later). If you’re providing expertise and services on an ongoing but infrequent basis, you should charge a monthly retainer fee. There’s a more detailed breakdown of each pricing model (and some mistakes to avoid) available as a free bonus download for this article. I get that. And maybe you’ve tried some of this before with bad results. But I’m telling you, it’s worth trying to figure it out. I did a pricing webinar recently where I covered all this in more detail; the free bonus download has that recording. This might seem too good to be true. But that doesn’t mean it’s easy. Pricing is an art form and a skill just like design, coding, or writing. You’ll have to practice a little bit to get the hang of it for your own situation, but I promise that it’ll pay off if you stick with it. I just got an email from a freelancer who landed a project from a new client. He was emailing because he had taken my advice to experiment with value-based pricing, and instead of selling the client a murky arrangement where he’d work at an hourly rate (neither of them knowing where things would land, and both of them taking on a lot of risk), he sold a flat rate project at $7500. The freelancer estimates that because of the skill he’s built up and new improvements he can put in place, it’ll only take him 18 – 20 hours to do this project. Do the math, that’s around $400 / hour effective! Even if he’s off by a factor of 2x, that’s still around a $200 / hr effective hourly rate, and multiples above what he was able to charge when he was just doing hourly. And just to be clear, the client is happy too, because they know what they’re paying, they know what they’re getting, and that price/value tradeoff is worth it to them.